Are you a candy lover? 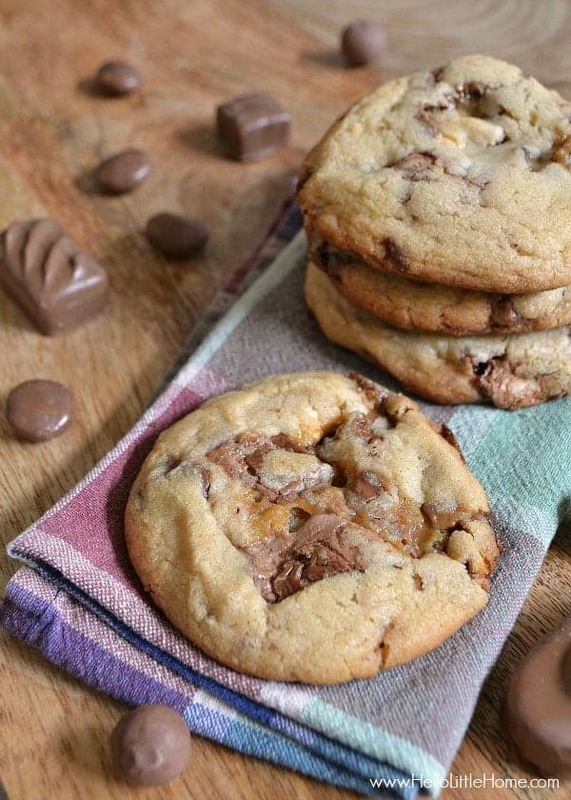 These thick and chewy Candy Bar Cookies are filled with your favorite sweets! Hi, Ginnie from Hello Little Home here! I’m excited to be back and sharing a recipe that’s filled with one of my favorite treats: chocolate candy! In addition to candy, I also love cookies. So I thought, why not combine the two? Everyone has their favorite kind of cookie, from thin and crispy to cakey to thick and chewy. 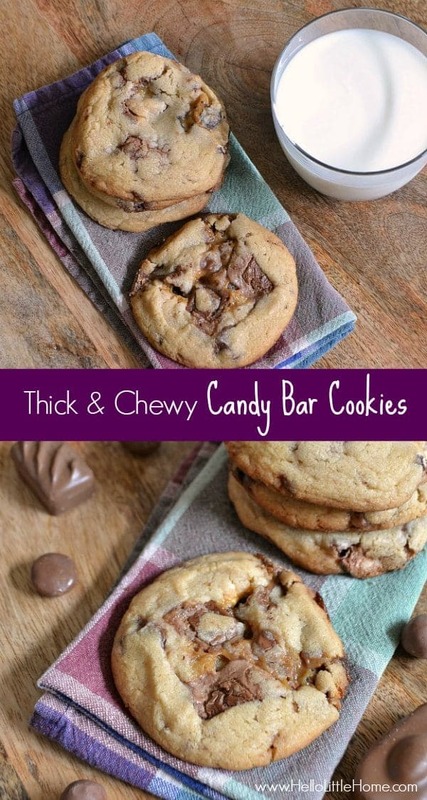 Mine is definitely the later, and these thick and chewy Candy Bar Cookies do not disappoint! There are a few secrets to these cookies. First, the butter is melted before mixing it with the other ingredients. Second, the cookies are refrigerated overnight. Both of these tricks produce a cookie that’s crispy around the edges while still being nice and chewy in the middle … just how I like it. Then there’s the candy! With Halloween just around the corner, sweets and treats are everywhere. 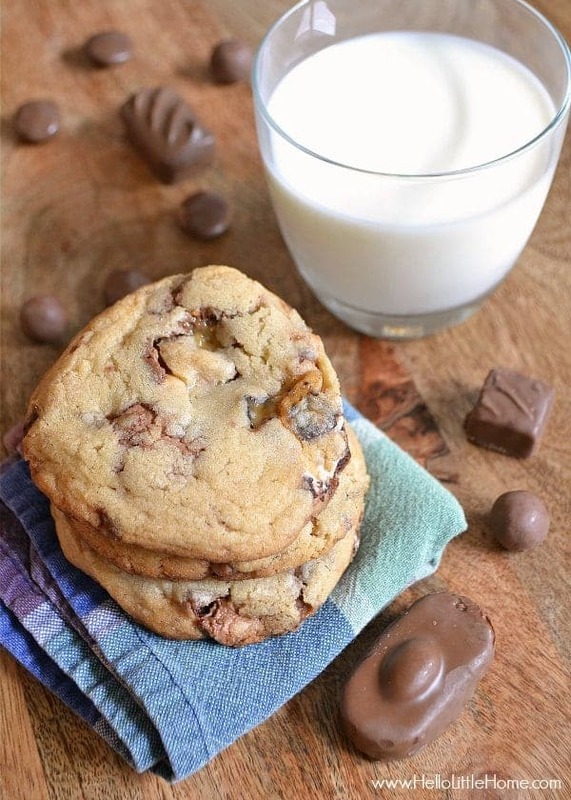 These thick and chewy Candy Bar Cookies are the perfect way to use up chocolates that weren’t collected on the big night or extra from your kid’s trick or treating haul. 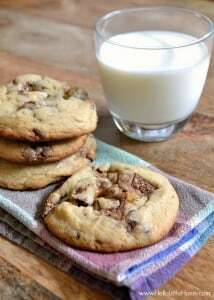 For my cookies, I used a mix of mini Almond Joy, Heath (my fave! ), Milky Way, and 3 Musketeers bars, plus Whoppers and Milk Duds. Choose your favorites, or keep it simple and use a few regular size candy bars. Everything gets chopped up and added to the delicious cookie dough. The candy tends to spread when it’s baked, so try to press it into dough when you’re dividing up the cookies. Once the cookies are formed, refrigerate them overnight (freeze them for an hour or two if you can’t wait). Your patience will be rewarded with an amazing treat! Melt butter in a large bowl. Add sugars, salt, and vanilla to butter. Mix until smooth and shiny. Whisk together baking powder and flour. Stir flour into butter mixture. Carefully mix candy bar pieces into dough. Roll dough into 16 equal balls and place on a greased baking sheet at least 1 inch apart. Gently press dough to flatten slightly. Cover baking sheets and refrigerate cookies overnight. Bake cookies for about 15 minutes or until browned around the edges and on the bottom. Let cookies cool on pan for 5 minutes, then transfer to a cooling rack. Allow cookies to cool, then serve right away or store in an airtight container. 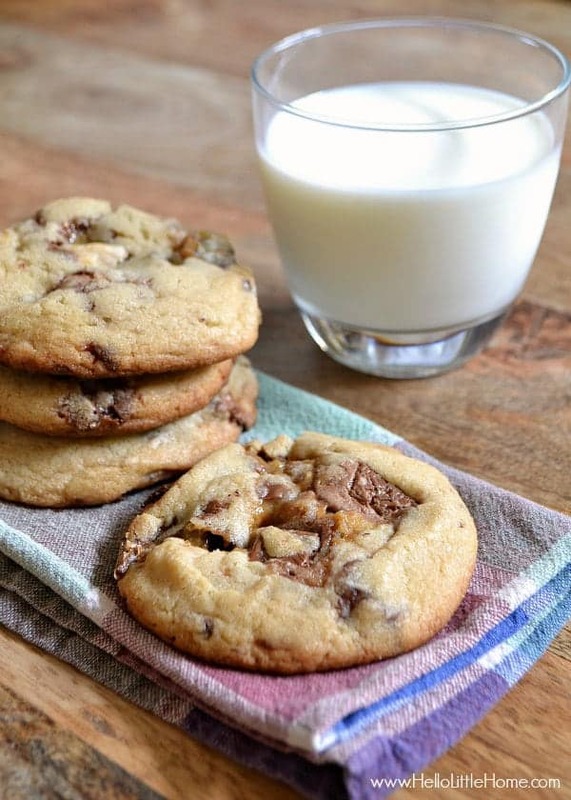 If you like these cookies, check out some of my other dessert recipes, too!